Like processions, performances of sacred plays, and the sermons of street preachers, images were a part of the spectacle of life in a Renaissance city. 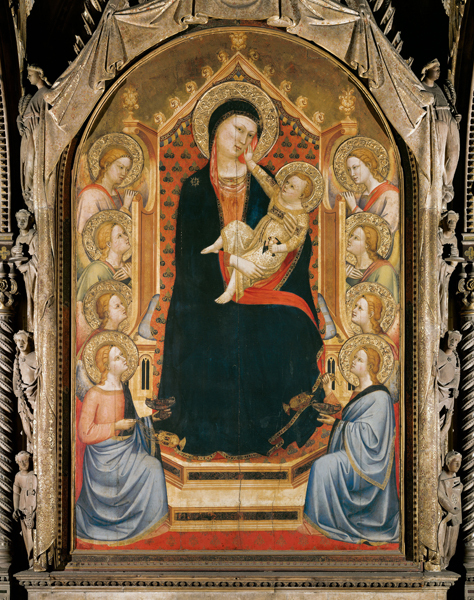 In Florence three miracle-working images of the Virgin were the particular focus of public devotion; they played a role in shaping and projecting the city’s identity. Citizens of all ranks participated in their rituals, most of which took place in the open air. Confraternities took them under their care and sang hymns to them; jealousies were sometimes aroused. 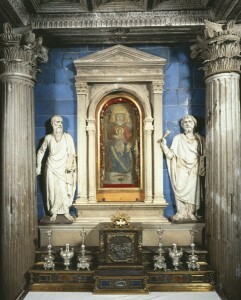 Individuals, even members of elite and humanist circles, paid private visits to the images to pray and invoke their help. The powers of another miracle-working Virgin, a panel that resided in the small town of Impruneta six miles outside the city, were activated only when she was brought in procession to Florence. The panel, known as the Impruneta, was called on to bring rain (or stop it), but she protected the city in many other ways as well, such as saving it from sacking armies and inspiring wisdom in political decisions. Contemporaries treated her like a real person who not only heard their prayers but also appreciated the gifts they made her (see “Excerpts from the diary of Luca Landucci about the Impruneta”). The rich tabernacle framing the Annunziata was commissioned in 1448 by the Medici family. 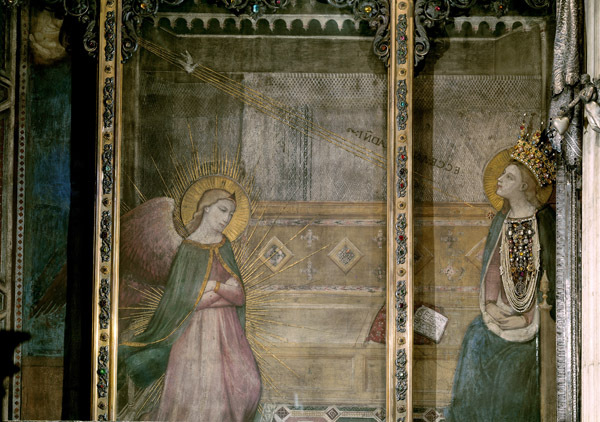 Small copies could be seen set into walls along the streets of Florence, and the composition became one of the two models most often used in the city for depicting the Annunciation (the other was a mosaic in the baptistery from the late thirteenth century). When important foreign guests visited the city, they were taken first to see the Annunziata, even before meeting with officials. Rich and poor alike made votive dedications to the image. Some of these were in the form of simple stamped reliefs; others were paintings or wax effigies. 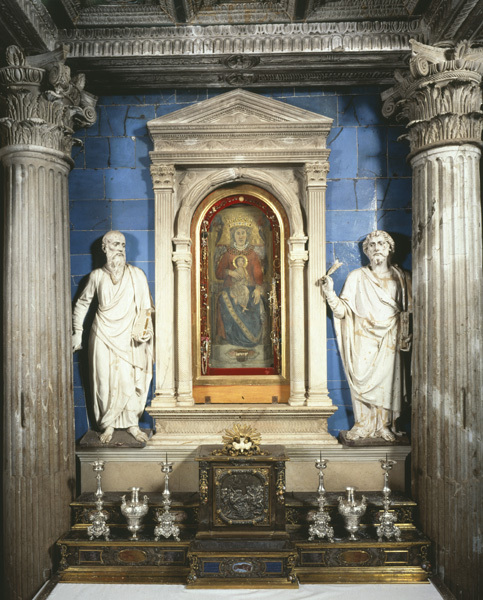 Although the ex-votos had been culled periodically, some 3,600 were extant before they were removed from Santissima Annunziata in the 1630s over strong popular protest (see “A wax ex-voto for the Virgin of Santa Maria in Carceri”). 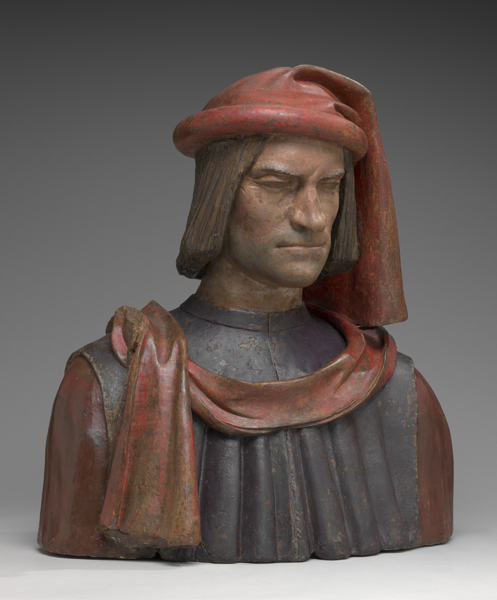 In 1478, Lorenzo de’ Medici survived an assassination attempt that claimed the life of his younger brother. As thanksgiving for his deliverance—and to press home his political survival—he had wax effigies placed in several churches, including Santissima Annunziata. One of them was dressed in the actual garments Lorenzo had worn on the day of his attack. This terra-cotta bust may reproduce one of those wax votives.